Recommended to: Readers who want a thrilling mystery, but can also put up with the character's OCD tendencies. 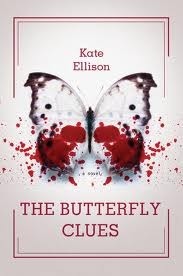 How on earth do I explain to you how much I loved The Butterfly Clues? It seems like anything I say just won't be enough. There is a mystery at it's core, and one that is beautifully done. I had no idea the entire time where the story line was ultimately taking me. However it's so much more than that. Layered on top of it all is the story of a girl who is looking for redemption, the inability to let go of the past, and the deep want to face the future head on. This book is amazing. Before I dive into the meat of why this story blew me away, I feel it only fair to tell you about our main character. Lo isn't your normal teenage protagonist. Her heart was broken by her brother's death and she's been struggling to pick up the pieces ever since. Even though Lo's heart is in the right place, her guilt has caused her to pick up OCD tendencies. These show a lot in the story line. I'm warning you because they can be very disconcerting and distracting. Following a character who is constantly muttering tap tap tap banana and counting random items can be difficult. However I will promise you that if you can overlook the little things, and focus on the person that Lo is under all of this, you'll fall in love. Now for the good part. The mystery. Lo finds herself inexplicably drawn to certain items, and locations. It is this habit that lands her in the middle of a murder investigation. I won't go into too much detail because, despite how difficult this plot is to figure out early on, I dislike spoilers. What I will say is that Kate Ellison weaves a story that will pull you in deeply. The setting of Neverland is amazing. Kids go here to hide, to disappear, and for Lo that is the attraction. There she can be whatever she wants. It is the anonymity of it all that allows her dive deeper and deeper into the mystery, and ultimately into danger. As I said, this part is so well done! Once the story takes off there isn't a moment to breathe, and I loved every minute of it. I'll quit rambling and get straight to the point. Lo's story is fascinating. I know that some readers might be put off by her OCD tendencies but I'll tell you honestly, it wouldn't be the same story without them. Imagine being unable to run away from danger because you had to your count steps. Or being so filled with the need to take something, or go somewhere, that you put your well being at stake for it. Lo is special, and it is her overall character that really makes this book. Even if it doesn't sound like something you'd normally read, give The Butterfly Clues a chance. I loved it! I hope you will too.